Your choice for the engineer of the Spaceship "Dream Team" is Kaywinnit Lee "Kaylee" Frye from Firefly ! This is another cracking good choice guys. I was wondering if we'd get any "Browncoats" on our crew. Kaylee is a lot of fun. She has a great sense of humor and should really keep the crew light-hearted. Best of all, she's a great mechanic. If she can keep the broken down "Firefly" running, she should be able to fix anything the "'verse" can throw our way. If you'd like to read more about our fabulous Spaceship "Dream Team" poll go here. For more information on last week's poll go here. Next up is the ship's doctor and we have some really tough choices for you guys. Keep the votes coming. 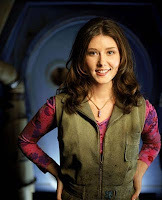 This poll just keeps getting better!Was Kaylee your favorite choice for our ship's engineer?